The ABVP has issued an official statement condemning on the branding of the Jawaharlal Nehru University as anti-national. It has also criticized the assault by layers on JNU teachers and students. This statement comes even as the right-wing youth wing ideologically affiliated to the RSS gave out a call for nationwide flag march on 18 February against the "anti-national activities of JNU"
We criticize the branding of the JNU as a den of anti-national activities. Campaigns with #ShutdDownJNU are nefarious activities which intend to malign this institution of national importance. We recognize the contribution of JNU in the nation-building process as well as the strengthening of Constitutional values. We also condemn the kind of manhandling and abusive treatment meted to JNU Community in the Patiala House Court. The ABVP activists as well as sympathizers in the campus are being witch-hunted and threatened with the possibility of grave consequences. Even apolitical as well as neutral students in the campus who condemn the anti-India slogans are being slapped with the charges of being conservative. Some of the teachers in the campus are openly stigmatizing ABVP as a small bunch of hooligans as well as goon. We graciously remind them that we are also your students. There is a continuous effort of our ridiculing as well as process of 'Inferiorization' and marginalization in the campus. The supporters of 'unity and integrity of India' are termed as 'Bahashkrita' and the supporters of anti-India as 'Purishkrita' and"enlightened" in the campus. In this milieu, we 'allege' that the widely circulate news of split in the ABVP is a result of process of witch-hunting and defamation. ABVP organization came to know about this through the media reports. Some newspaper as well as news channel are running the news that they had resigned at an earlier point. We deny any such communication or evidence of this development. We demand that these sections of media must take an official position. ABVP still awaits an official confirmation from these students. The three ABVP members are namely Pradeep, Rahul Yadav and Ankit Hans have resigned the organization. We appreciate their active role in strengthening ABVP in JNU and believe that these students have taken this decision under intense pressure of Communists teachers. These three students were pursuing first year MA course inCentre for Historical Studies (CHS) and Centre for Economic Studies and Planning (CESP) in the School of Social Sciences (SSS). This School has traditionally been the citadel of Left politics. The movement for the removal of disciplinary committee as well as police action on the 8 students who organized this event is also led by a major section of the faculty of the School of Social Science(SSS). The rise of ABVP in SSS in particular has been perceived as an existential threat to all Leftists: be they faculty or students across all party lines in the left. 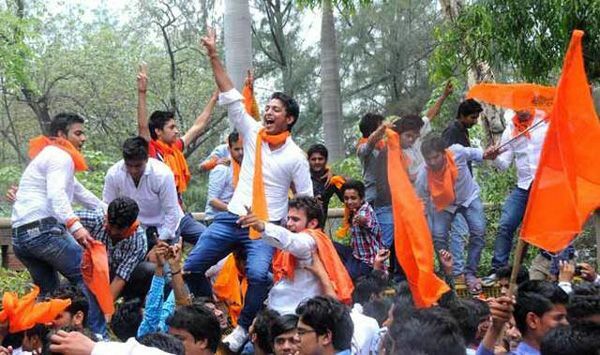 To stop ABVP's rise, the nexus comprising Left-leaning faculty, students along with administration systematically discriminates and harasses our students and engages in witch-hunting of our activists as well as sympathizers by engaging in maligning characters, labeling students as "sanghi goons and lumpens", awarding poor grades, filing fake cases of sexual harassment or violence in GSCASH (Gender Sensitisation Committee Against Sexual Harassment) and Proctorial board and so forth. We believe this act of resignation of our three activists is under pressure of anti-India forces or opportunist Communist political organizations operating within and outside JNU with the motive ofdiverting public attention away from crucial investigations surrounding the 9th February, 2016 event in which Communists were seen chanting anti-India slogans such as Bharat ke tukde honge hazaar. Insha Allah! Insha Allah; Bharat ki barbadi tak jung rahegi; Afzal hum sharminda hain, tere qaatil abhi zinda hain, etc.' towards non-serious issues. Recently, we have also seen how the Communists attempted to malign characters of our three activists Aditya Kumar Singh, Bhaskar Jyoti and Shruti Agnihotri by circulating a doctored video in which they were shown by them as raising pro-Pakistan slogans. ABVP immediately filed complaints with the Delhi Cyber Crime Cell as well as Vasant Kunj (North) Police Station. The fakeness of the video was certified by both JNU administration and Delhi Police. As a matter of record, on 9th February, a gun was flashed at JNUSU Joint Secretary Saurabh Sharma by masked men, who threatened to kill him whenever he steps out of campus. On February 9, he threatened and intimidated over phone call from number traced to Australia. The callers warned him of dire consequences, if he further pursued against key accused of this anti-India programme. Prior to this, two of our popular activists in the School of Languages (SL), Rohit Kumar (Vice President, ABVP-JNU) and Ranveer Patel (President, SL Unit, ABVP-JNU) have faced academic discrimination. Having completed their BA from Chinese and Persian respectively, they're associated with ABVP-JNU for over three years and have even contested elections and lost by extremely narrow margins. Rohit, who has got good grades in all subjects, was failed in Oral examination. The University examination system has opportunities for re-examination, which was denied to Rohit exceptionally. Similarly Ranveer has been also failed and his demands for grant of zero year has been denied to him, while given to other students. In the year 2010, when the Dantewada massacre took place in which our 76 soldiers were martyred, the Communists of JNU welcomed the programme and celebrated it with loud DJ music. They also stamped Tiranga (National Flag). When ABVP activists opposed this, they were badly beaten up. Also nine students of Persian Centre were identified and all of them were failed. This was violation of the National Honours Act. This is widely reported in the national media. While the Communists always claim themselves to be the biggest champions of free speech and democratic rights, they deny the same to others. Recently, Gaurav Kumar Jha, who was the Presidential Candidate of ABVP in JNUSU 2015-16, expressed his displeasure on Facebook over boycott of Nirbhaya movement by Communists and demanded passing of Juvenile Justice Bill. He had said, "GSCASH has been unfortunately reduced to target all those who are opposed to the ideology of Left. Be they faculty or students. We all know how your party DSF got Prof. Warikoo removed and appointed Prof. Chenoy so that all vacancies in SIS can be filled". For this, he was summoned by GSCASH that dictatorially read, "for breach of confidentiality clause". Later, in the hearing, they couldn't establish the charge against him. This tells us about their tactics of intimidation meted out to our activists. Khattar is firefighting, but could #JatQuotaStir cost the BJP in UP? READ NEXT >> Khattar is firefighting, but could #JatQuotaStir cost the BJP in UP?